The California based department store, Gottschalks opened a new 55,000 square foot store in Bend, Oregon last week. I sold limited rights* to 2 of my paintings, Spanish Sonata and Blue Bird Hacienda from my Spanish Rose Series to Gottschalks so that they could have them turned into murals for the atrium. Not only am I honored to have my art chosen, I am amused by the irony of making a mural 20 plus years later for the same location. Here's what happened. During the late 1980's I was the lead (and only) outdoor advertising billboard painter for the entire Central Oregon region beginning south at the (then) tiny town of La Pine, Oregon and north into the town of Madras, Oregon, on the edge of the Warm Springs Indian Reservation. I worked for Carlson Sign in Bend, Oregon and hand painted billboards on metal sections or paper. This was right before computer printers took over the market. Now it is rare to see a hand painted billboard. 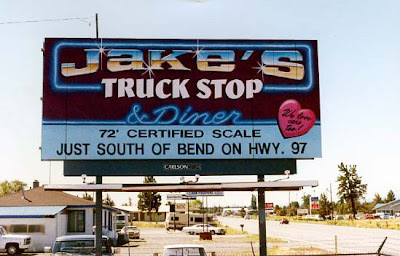 Jake's Truck Stop and Diner was a landmark on South Highway 97 in Bend, Oregon, from the 1970's through most of the 1990's. Truck drivers could dial a real 5 pound phone from their table, enabling them to eat and relax while checking on business or calling loved ones. Meals were gourmand piles of carbs with sides of extra gravy and cute girls pumped the gas. The showers were clean and the lot was big enough to ho st a small village of overnight sleepers. I painted this 24' long by 11' high sign for Jake's Truck Stop & Diner (circa 1989) on metal sections using alkyd bulletin colors. I used rollers and brushes for most of the under painting on the billboard. I painted the cool looking airbrush effects with a quart sized air gun and 24" wide rolls of masking paper. I remember the satisfaction of painting the "sparkles" on the "chrome" Jakes's name as the finishing touch. Jake's is still around, but it's now just a diner in another location on the east side of Bend, OR. The phones are gone along with the gas and everything else. Times change. Where Jake's used to be is now a new shopping center. And the anchor tenant for that shopping center is Gottschalks. The Gottshalks building was designed by Linane/Drews Architects (from Burbank, California), on the site of the old Jakes' Truck Stop and Diner, on South Highway 97.
photo by Pete Erickson of my 2 paintings in the entry atrium of the new Gottschalks store. 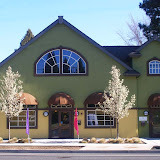 ~ High Desert Gallery, Redmond, Oregon -- 541- 548-1811 (direct) 453 SW 6th Street at Evergreen Street. When an artist makes a painting, under current U.S. Copyright law they automatically own all rights to that image. What this means is that even if you own an original piece of art, you do not own the rights to sell or use images of that art without written permission (and usually, payment) from the artist. This process is called licensing art. Copyright laws are integral to the success and survival of artists in our country. Because I own the copyrights to my paintings, I was able to assign Gottschalks the right to create the 2 murals in their Bend, Oregon store. Copyright laws for artist's must be protected. I am passionate about vigilantly protecting copyright laws and have lobbied to stop the Orphan Works legislation. Point and Paint spam is as thick as autumn leaves. It's the name of a new painting tool, targeted towards Do-it-Yourself home owners that claims to take the job of painting a room (including the ceiling) down to about an hour. I've used paint pads before, but thought I'd look at the company's official website (rather than clicking through on the spam) and check out the painting product. I watched the video and am completely unconvinced. So apparently are a lot of users of this product. Complaints about Point and Paint are also on page one of my Google search. 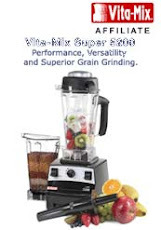 Here is the link to the InfomercialScams.com website. True, I haven't used the Point and Paint product, if they want to send me a sample, I will -- and review the item. Nonetheless, from the way the product is presented, I'm not convinced it would work well at all. Edging and painting your home interior are best done with rollers and brushes (or a compressor sprayer in some circumstances). I use paint pads for stains (easily available in any paint store). Painters Tape (it is blue) is insurance against the slip of a brush, but not fail safe. I suggest a high-quality cutting brush like a Purdy (available in most paint stores). Load a good cutting brush with paint, then make 2 brush strokes about 2 inches long "in-place" on a paper plate. This gives your cutting brush a good edge. Face the wall (area to be painted) and take a deep breath at the same time you touch the brush to the wall. Hold your breath as you make the line. Exhale when the brush comes off the wall. So. 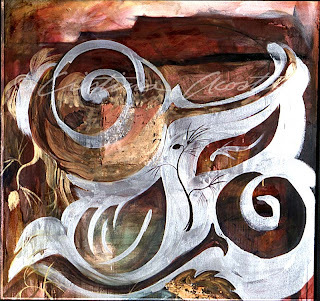 . . yoga and meditation breath work has a practical application to painting. It may seem a bit strange, but it really worked for me. Eventually I got so good at "pulling" straight lines (that's what billboard painters often called a long single stroke of the paint brush) that I didn't need to concentrate on my breathing. Let's hope you aren't painting your house for that long! Just wanted to send you a note to let you know how much I enjoyed viewing your work. You've accomplished a lot. I have a Masters Degree in Art....used to do a lot of Chicano Art..studied the old masters techniques for one yr. in Florence, Italy and finally I plan to retire early next year to pursue my art. I have been inclined to paint retablos and to build and paint small altars and try and bring back this beautiful tradition we once had in South Texas. 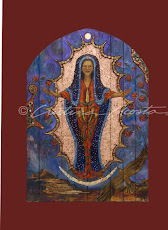 I am from Las Vivoritas Ranch, a land grant in parts of South Texas ...mostly in Jim Hogg County....but I've been living in Corpus Christi, TX for many years...I have been looking at other works being done by many New Mexican Artists and I appreciate everyone who has remained true to their culture and promote it via art or music. Your art has inspired me to go home and paint this weekend and I just wanted to let you know....thanks for placing your work an your life for all of us to see, it only reminds me of all our people spread over this wonderful country....keep creating and good luck in all that you do and will accomplish in the future. Thanks for the nice note Roel, I appreciate your support. 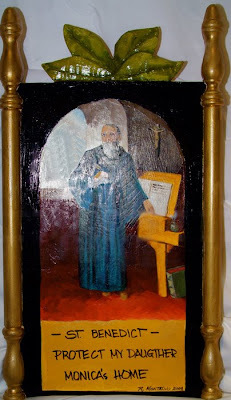 Thank you for writing about the tradition of painting altars (retablos) in Texas. I'm excited to share this image of your retablo you made for your daughter's home. Please keep me updated on your work. For those readers who aren't familiar with retablos, here are some of my observations about the art form of the retablo. There are two types of retablos, the Santos (an image that includes a Saint or member of the Holy Family in the Catholic Christian tradition), or an Ex-voto (an image created in gratitude for a blessing received). There is a long tradition of painting altars in this country, especially in the American Southwest. And the influence of the old masters is an integral part to his type of work, something that surprises some viewers of retablos, as retablos including Santos and Ex-votos are considered to be folk-art by some viewers. Though there is a "folksy" quality to the pieces because artists of all skill levels paint retablos , it's more a modern perception than the reality of the people that paint them. Originally, the Spanish artists that brought this tradition to North America were trained in the Renaissance artistic traditions of their times. 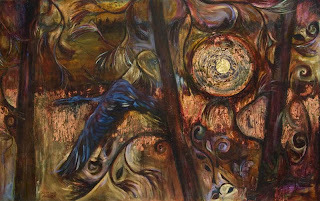 As generations of artists copied and interpreted the theme, far from the painting studios of Europe, the style changed. Still, when I look at many pieces I see compositional devices and a visual approach that is European in origin. Retablo images often reveal a beautiful blend of cultures that has been slowly changing over the centuries. A lost racing pigeon bunked in the eave of our house for a couple of weeks. I tracked down the local racing pigeon group and after describing the bands on the bird's legs, the man I spoke with urged me to catch the pigeon so that it could be returned to it's home. The bird had other ideas. It stayed comfortably out of my range, and grew plump on the cracked corn and sunflower seeds I pour into the bird feeders around my garden. I last saw the racing pigeon flying towards downtown Bend, Oregon with a wild pigeon friend. It had discovered it's heritage and took the plunge to live life in the wild. That's how I've been feeling lately, like I'm rediscovering my heritage. Not in a cultural sense, but in a human/animal sense. It started with learning to surf my SUP board. After a summer and autumn on the water, I found something in SUP paddling and surfing that energizes me. I'm deeply respectful and sometimes scared of open water and the ocean, so surfing isn't only about fun for me. I'm very aware when I venture off shore that I'm entering a wild and impersonal food chain. And when the wind and waves change from friendly to scary, that only compounds my fears. But, the ocean has a deeper metaphorical and spiritual meaning for me that became part of my consciousness as a child growing up on the California coast, so I didn't let fear stop me. I coped with the water despite my anxiety and stuck with it long enough to actually enjoy myself. Crossing over that personal hurdle has been positively affecting my art. I've gone back to making large images and continue to explore where my retablo series takes me. My series of altars (retablos) is growing and is now beginning to be exhibited as a group. This month has been an exciting blend of local, regional and national exhibits. In Central Oregon, High Desert Gallery is exhibiting my series of Madonna retablos (altars) at their Redmond, Oregon location. This is the first time 14 of these ex-voto style retablos have been shown together. Regionally, Onda Gallery in Lake Oswego, Oregon (a suburb of Portland) included my large oil, Sentinel Moon - Blue Heron in a show benefiting the Friends of Tualatin River National Wildlife Refuge. 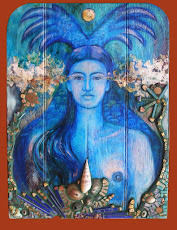 And their Alberta Street Location is showing my retablo, La Sirena (The Mermaid). Nationally, the ASU Arizona State University Museum of Anthropology is exhibiting my 16'6" charcoal drawing, Love Always (Siempre Amor) created for their 9th Annual Dia de los Muertos Festival exhibit, Oct. 28, 2008 - Jan. 29, 2009. 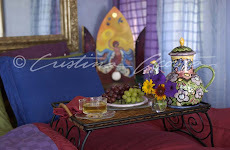 Along with the art, I continue to write design articles regularly for Latina Style magazine, and to color consult. I like sharing home design ideas with clients, it's a satisfying way to share my creative skills when I'm not painting or writing. I encourage you to continue to explore whatever it is that energizes and enhances your passionate self. It's the best way I can think of to stay creative and positive during this time of economic uncertainty. I'm looking for a color palette to complement the old Mexican unglazed pavers that cover half the living space in my home. This is a small house with an open floor plan. I have exposed beams and squarish columns. I think it's mission style? I've found reference to a"hacienda style color palette" from Pittsburgh paint but it"s not available yet. Do you have any suggestions for me? Your house does sound like it's Mission or Territorial Spanish style. Usually the beams are natural wood or darkened with age. The walls tend to be a version of a warm white. Centuries ago in New Mexico and other areas of the Southwest, it was usual for the final interior plaster coat to contain mica if that mineral was available. The bits of mica in the wall plaster would subtly reflect the candlelight, making the most of the light of the candles. 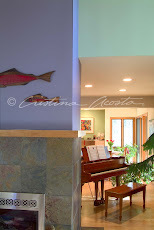 Of course, you don't have to be overly traditional with the colors you choose, or put mica in your plaster. It's good to know the traditions of a particular style so that when you alter them to create a contemporary color palette, your choices make conceptual sense. Pittsburgh Paints Voice of Color has a wonderful selection of color groupings. I suggest that you visit the paint store and ask to check out a fan-deck of paint samples. Open the fan deck and fan it into a circle so that you can see the various colors against the floor. Do this with daylight. Note the colors that you think look best with the floor, then double check them against any other elements in the room, such as a fireplace, wood ceiling, beams, furniture or favorite painting. Winnow your choices down to the few you'd like to test. Visit the paint store for samples of the actual paint and do a test area of at least 2' x 2' and in a corner so that you can see the color on 2 planes of walls. If you'd like to read about my color consulting services, contact me and put the words, Color consulting, in the text box. I'll send you a link to my FREE E-booklet explaining my service. Ask Cristina: What Color Should We Paint an Accent Wall? I am having a difficult time finding the right color for our great room. It is fairly large, 20x30, with a cathedral ceiling 22' high. On one wall there is a floor to ceiling stone fireplace, taking up the entire wall. The ceiling is a honey tongue and groove wood and the floor is a natural oak hardwood. The furniture is a southwest design. Is it okay to paint just one wall a dark color and the rest a lighter shade? Is a brown too much with all the wood? Sounds like you have a beautiful room. I can't tell you which color to paint, but I can give you a few ideas to think about that may help you with your decision. Painting one wall a strongly different color than the others creates an accent wall. Only do this if there is something on that wall or the architecture in that part of the room that you wish to emphasize. Click here to read more about accent walls. If you insist on a brown accent wall, then choose something strikingly different in value from your existing woods, such as a deep chocolate brown wall. Send a before and after when you get the room painted. I'd love to post the results. The premise is that the public is being harmed because it doesn't have enough contact information to locate copyright owners. The conclusion is that artists must change their business models. What's lacking is any evidence in between. The anti-copyright lobby is well funded. They have powerful backers. They've warned us they'll be back next year. We should take them at their word. Ask Cristina: How do I Fulfill My Creative Dream? 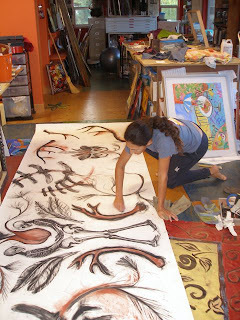 My name is also Cristina Acosta and one of my dreams for many years now has been to find a link between my artistic side which I have but haven't explore and with my business career. I'm a financial adviser. I keep hitting obstacles...I can't believe that someone with my name is doing things I would have loved to learn to do many years ago....I want to learn more about how you started your career as an artist and what inspired you. Thank you for contacting me. You wrote that you are interested in developing your artistic side. There are so many ways of creating and being creative. I hope you are not discouraged thinking that you have to take years to build creative skills before you can express your creativity. Artistic skills are helpful (sometimes necessary), but it's likely you have developed an aesthetic through your life experience including travel, shopping, eating and cooking, etc., that has developed your creative self. You may have more of a developed well of creativity to draw from than you think. Even if you have limited life experience, observing things deeply will always be of benefit. I encourage you to reach for your dream to be creative in even the smallest daily way. Don't wait for that mystical far-off time in your future when you'll have enough time, energy and money to do what you feel you are called to do. Start creating today in a small way and you'll be pleasantly surprised how the small seed of attention you plant within yourself will yield more than you can envision now. Here are a few tips that can help you get started working with your creativity daily. Choose a medium that you can work in at least 5 days per week, such as photos (using your cell phone or camera), drawing, video, writing (notebook, computer, blackberry, etc). Dedicate 5 minutes per day to collecting info (taking pictures, jotting down notes or observations, etc.) You can always do more, but aim for 5 minutes to begin with. That's it. Do that for at least 2 months and then you'll know what your next step is. You'll have a lot of information about what deeply interests you and you may even surprise yourself with what you know. Please write me when you've done this and share some of your work. With National Hispanic month behind us and Dia de los Muertos (the Mexican holiday, Day of the Dead) ahead of us, it's time to talk about the autumn tradition of drying and roasting chili peppers. In New Mexico, especially in communities around Santa Fe and Taos the centuries old Hispanic traditions of drying and roasting chili peppers is alive and well. Even if you haven't developed a taste for authentic Hatch chilis, there are many wonderful dried chilis available in both mainstream and Mexican markets. Whenever I visit Santa Fe, New Mexico I always go to Jackalope on Cerillos Road for the best buy for chili ristras and wreaths and then to the Whole Foods grocery store for a visit to their bulk department where I fill up with enough dried green chilies to last the year. I make Red Chili Sauce most every week and eat it in a variety of dishes. One of my most favorite things to make with my red sauce is a New Mexican dish called Carne Adovado. It's a beef pot roast cooked for hours in chili sauce until it falls into strings of deliciousness. If you want to try an entire New Mexican/Californian/ inspired dinner, try my Dinner Menu. It's easy to fit into a scheduled day when cooking isn't at the top of your list. Note: My oil painting, Red Mesa is filled with the red tones of dried chilies. The original oil painting is 48" x 48" on canvas and is $4,800.00 framed. The best thing about bringing creativity into my family life has been the positive effect it's had on all of us. I'm a proud Mom and ready to share with you the paintings my daughter Isabella Acosta Barna created. They're so good, I wished I did them. I've been making art since I was a baby. My mom would take me to the studio with her, so I was always making things. Now I like to paint using spray cans. The Alliance for a Healthier Generation asked me to make some paintings about playing/exercise and nutrition to use on the Healthier Generation website. They sent me a color palette to use and I bought spray paint in those colors. My mom took me to a art canvas factory and we bought stretched canvases to work on. Here's a photo of me working. I always wear a respirator so that the paint fumes don't hurt my lungs. 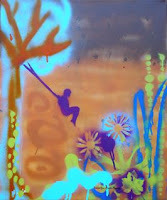 I use plants, found objects and stencils that I hand cut for my paintings. Here are the 4 oil paintings that I finished for the Alliance for a Healthier Generation. The original paintings are for sale for $300.00 each. All of the paintings are 18" x 24" on stretched canvas and wired on the back. "Spring Swing" is 20" x 24". It's been a long time since I've worked on a large drawing though I love creating large scale drawings and paintings. 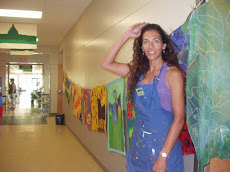 I experienced creating art on a large scale during my advertising billboard mural painting years in the 1980's, but that size and scale of art is problematic to frame and store, so I've since kept to smaller sizes of canvas and paper. I got lucky recently and got the opportunity to make something large. A phone call from an exhibit curator at Arizona State University (ASU) Museum of Anthropology got me started again with large work. I was invited to participate along with a group of artists in creating work for a ofrenda (altar offering) for the 9th Annual Dia de los Muertos festival exhibit that will run Oct. 28, 2008 - Jan 23rd 2009. Asked what I'd like to contribute, I suggested a large drawing of bones. The curator said yes, so I ordered a 10yd roll of paper from Daniel Smith, Inc. and got to work. It felt so great to be working large and for a purpose. Unless a piece is requested (for example, a commission), I try to restrain myself from creating large pieces as it's a hardship for my husband to schelp from exhibit to exhibit! I finished the drawing this week and have prepared it for shipping. The final measurements were 52" tall by 16'6" long. I'm debating the title still. When I figure it out and get the photos back from my photographer, Gary Alvis, I'll post the final info. I don't usually work on just one piece of art at a time. Between 3 to 6 pieces are laying around my studio in some stage of "thinking". The pondering time can last for days or months or occasionally longer until the image occurs to me and begins to flow through. My series of retablos (a type of Hispanic sacred art form) contain images of the Madonna / Goddess / Divine Feminine that "come" to me in a very metaphysical way. 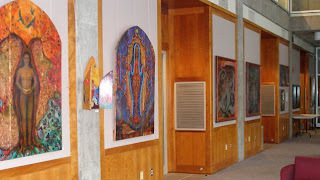 I've shown some retablos singly or in small groupings, (like this photo from OHSU) but until this month, I've never exhibited them all together. Now, over a dozen of my luminous Madonna altars (retablos) are together for the first time at the High Desert Gallery in Central Oregon. The exhibit is at the High Desert Gallery in Redmond, Oregon for the month of October. 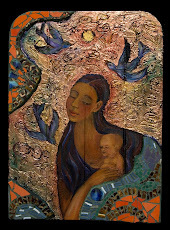 Then the retablos will travel to the High Desert Gallery in Sisters, Oregon. Coincidentally, the first half of October is also part of Hispanic Heritage Month (Sept. 15 - Oct. 15). Before this month, some of my images of the Divine Feminine have been exhibited in various venues, including Nordstrom Department Stores and Oregon Health Science University OHSU in Portland, Oregon. It's really exciting for me to see all of the retablos together, I hope you can drop by the gallery or contact Todd or Myrna Dow (the gallery owners/directors) for a private showing after hours. Retablos (or altarpiece in Spanish) are a traditional sacred art form with roots that pre-date Christianity, with roots in the Mediterranean areas that include part of what is now Italy. The art form of the retablo first came to North America with the Spanish settlers and artisans that followed the Conquistadors to the North American continent to settle what is now Mexico and the United States. There are two types of Retablos, the Santos and the Ex-Voto. The Santos style of retablo is either a Saint (from the Roman Catholic Christian tradition) or a member of the Holy Family. Similar in concept to the art form of the Byzantine and/or European Orthodox Catholic icon, the Santos is painted in accordance with strict liturgical rules that define how the central figure of Saint or Holy Family member is represented. The counterpoint to the Santos is the Ex-voto, a no-rules, personal vision that is created to commemorate a blessing received or when a prayer has been answered. The Ex-voto retablo is the art form I focus on. I love it! This retablo art form gives me a way to connect with the religion of my childhood, without having to get into any personal struggles with a dogma that doesn't always jibe with who I am now. I paint my retablos to express and explore my gratitude for the blessings of my life. My favorite subject is the Divine Feminine which I interpret as Madonna / Female Creator images. Because my Spanish/Mexican ancestors migrated to North America in the 1500’s, I also include American Indian symbols, as that heritage is sure to be part of my mix. Along with the visual symbols of my work, the materials I use have personal meaning. My Ortiz ancestors where famous goldsmiths. Thin sheets of 22kt. gold leaf, copper and sterling silver glisten under and over layers of oil paint and evoke the presence of those ancestors. The antique ceramic tile mosaic is glazed with 24kt. Gold and is from a now shuttered ceramic factory in the same area of Southern California where I grew up. The wood panels are built by an artisan wood worker and mostly include re-worked lumber siding from razed timber mill buildings in Bend. I finish each Retablo with a blessing, usually on the back of the image. In the old tradition of territorial New Mexico, the Retablo often became the spiritual focus in the home when travel was dangerous and people could not attend church. Centuries of isolation in New Mexico led to the unique form of the Ex-Voto often painted on tin, leather or wood panels. Artists were commissioned to paint retablos that often became symbols of a family’s spiritual life. In that tradition I offer myself to paint commissions of a Retablo for you that commemorates your blessings. Everyday I watch birds swoop into my yard, from small chickadees and finch to raptors like the Sharp Shinned Hawk or Peregrine Falcon. This morning I was working through some insomnia while a skunk waddled across my studio patio. 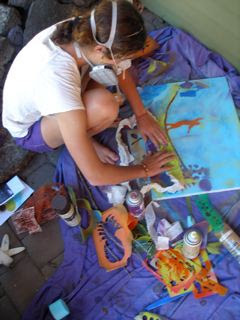 Wildlife and nature are an integral part of the my life experience, something I like to explore in my paintings. 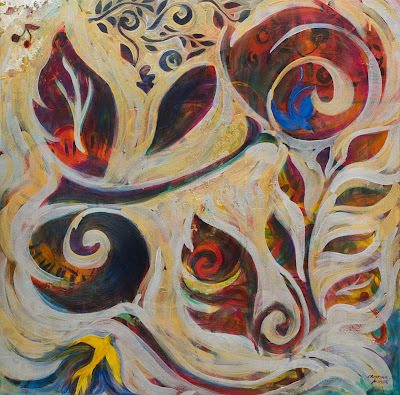 The Onda Gallery in Lake Oswego, Oregon (in the Portland, Oregon metro area) together with the Friends of Tualatin River National Wildlife Refuge have invited artists to exhibit work that celebrates the natural environment. A percentage of the proceeds from any sales on opening night benefit the non-profit environmental cause. When: Opening event is Friday, October 3rd, 2008, 6 - 9 p.m.
Sentinel Moon Blue Heron, my large oil painting is included in the exhibit, Celebrating Art and Nature - National Wildlife Refuge Week. The Tualatin River National Wildlife Refuge is run by the U.S. Fish and Wildlife Service. Just a few miles from the center of Portland, Oregon, the wildlife refuge is a beautiful and serene place to visit. Original paintings, sculpture and other artworks from the following artists are part of the Celebrating Art and Nature show for the month of October.